With silk or plastic flowers, you can create an attractive and long lasting centerpiece.This guide contains centerpiece ideas using artificial flowers. Take metal bucket, hot glue foam to bottom. Take Spanish moss and adhere with floral pins (the ones that look like a U shape). Next hot glue apples into place. Finally, fill in all areas with ivy, you can just poke these into the foam no need to glue if you don't want to. Voila, a really inexpensive country decoration. 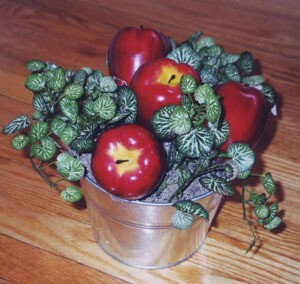 This fun floral craft is perfect for a centerpiece on the table, a small decoration, or a beautiful kid's craft. You just take some floral Styrofoam and arrange some fake flowers in it. You take twisted raffia, wind and glue it around the Styrofoam base, and voila, a fancy basket! Take flowers and poke them into the top of the Styrofoam cylinder, making a pretty arrangement. Let children explore and play with this step, experimenting on what combinations look the best. Adults should play with it a little too! Glue a piece of twisted raffia on the back of the Styrofoam bottom. Wind raffia around pot, gluing a little as you wind, keeping it tight and fitting. Keep winding until you get to the top of the pot, cut off remaining raffia, then tuck the edge of raffia under the back, glue in place and let dry. Use as a table or shelf decoration, or make mini-flowers in a basket as card holders, just stick the card onto a toothpick, and into flowers at each place setting. 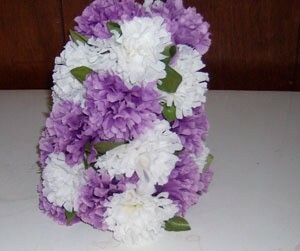 I used styrofoam cones and silk carnations to make this centerpiece.